Tella takes us on a walk through history at the World of Trails in Peräseinäjoki. 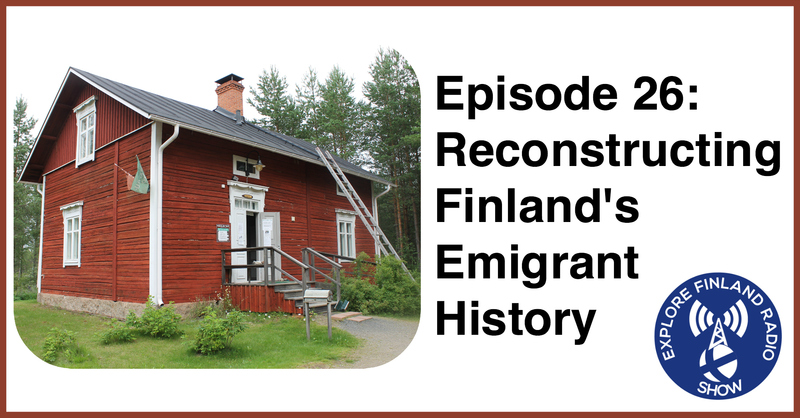 A collection of buildings, previously owned by Finnish emigrants, dismantled, moved and reconstructed in South Ostrobothnia. Once again, I’ve included a link to the interactive Migration Map from the International Organization for Migration. The tour started at the Hakala House, which also serves as a gift shop and coffee shop for the World of Trails. It is a traditional, South Ostrobothnia wooden farm-house from nearby Ilmajoki, opened at WoT in 2008. Although it wasn’t transported from overseas, it was built by Matti Hakala with money he made working on the railways in the USA, in the early-1900’s. The downstairs of the building is decorated with original objects and furniture from Matti Hakala. The sugar plantation form Ingham, Queensland, Australia, doesn’t look like a traditional Finnish building, but was home to Finish emigrants who moved to Australia. It is constructed of eucalyptus and corrugated metal – including most of the windows! You can hear Tella and I walk through the various rooms, looking at the tools and clothes on display in the sleeping quarters. She also explained how the workers wore thick, woollen clothes, even in the heat of Australia. You can also hear the story of the 4 metre (13 feet) long snake! The distinctive SAUNA number plate! The story of the Unkari cabin starts with a family knife fight in Kauhava that, sadly, ended in murder. Matti Unkeri received a life sentence but, after a few years, applied(!) for exile to Siberia in Russia. With no rail service, so this self-elected exile required a three year journey, mostly by foot, At the end of this odyssey, was several years hard-labour in a salt mine near the town of Omsk. Once Matti was released he started work on a nearby farm. He eventually married the Farmers daughter, and built this cabin for their family of 11 children. In the podcast, you will also hear Tella recount an apocryphal(?) story about Matti returning home to Kauhava for one day. Spoiler alert, there were still no railways!